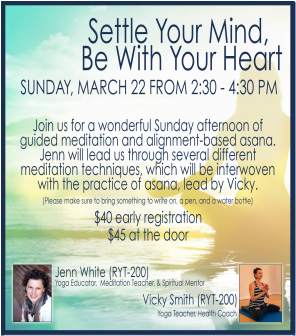 Join me for Vicky Smith's Jnana Yoga Series as we take an in-depth look at yoga through the lens of meditation in Settle Your Mind, Be With Your Heart. have an amazing afternoon ending in a restorative savasana! This workshop combines lecture, meditation, and asana practice and will alternate over the 2 hours between sitting with lecture and meditation with Jenn and moving in asana with Vicky. Please bring a yoga mat, journal, pen, and water. No meditation experience necessary - only open hearts and minds. When: Sunday, March 22 from 2:30-4:30 p.m.